U.S. Army Regulations made distinctions between Foot Artillery and Light Artillery. At the time of the American Civil War this distinction was one of function. Within the Regular Army there existed only Artillery Regiments. Within these regiments some batteries (companies) might be equipped as foot and others as light artillery as the needs of the service required. The 1861 Regulations uses the words, For Companies of Artillery equipped as Light Artillery." The point being that the distinction between foot (heavy) and light artillery had not developed such that these are to be viewed as two different branches of artillery, as they would become after 1902 when artillery was divided into field artillery and coast artillery. In the volunteer service certain regiments were named as being either heavy or light artillery. The term "foot artillery" did not appear as part of a unit title, but was used in the regulations for units that were not mounted on horseback and certainly heavy artillery units would have been considered foot artillery. Foot artillery was based in fortifications or in a few cases employed in a siege train and might be called heavy artillery. The cannon that they served were heavier and of a larger caliber. Light artillery was mobile and was a mounted service. In more modern times it times it would be called field artillery. The cannon that they were equipped with were necessarily lighter and of a smaller caliber since the roads and bridges of the period would not allow the larger cannon to be easily moved in the field. The key to the uniform distinctions were the mounted and dismounted nature of the troops themselves. It is likely that these distinctions were not strictly followed. Period photographs show members of heavy artillery units wearing features mentioned in regulations reserved for light artillery and vice versa. The major difference in uniforms was frock coats for enlisted foot artillery soldiers and jackets for light artillery soldiers. Jackets are more functional for mounted soldiers. Light artillery officers wore frock coats for dress and jackets with shoulder knots as undress. Officers of both categories seemed to wear shoulder straps, despite the implication that shoulder straps might be exclusively worn by heavy artillery and shoulder knots by light artillery officers. In addition light artillery enlisted men and officers might wear light artillery caps or shakos. These were issued only uncommonly and not worn in the field. The regulations suggest that units issued these would not also be entitled to the Jeff Davis (Hardee) Hat. Another difference was in the swords. The 1861 Regulations do not mention enlisted swords and sabers, but these are known from other sources. Foot artillery soldiers wore Model-1832 foot artillery short swords that however unlikely as a weapon would not impede a dismounted soldier in the way that a long saber would. This sword was said to be based on that used by the Romans. Light artillery, being mounted, wore a long light artillery saber of a different pattern than that used by cavalry. 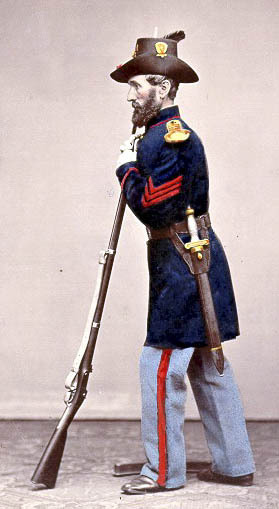 The foot artillery sergeant major in the above illustration is pictured as wearing a Model-1840 Noncommissioned Officer's Sword. I have been unable to discover among the enlisted personnel who might have worn an N.C.O. sword and who the short sword. Among the 1866 Quartermaster's Department photographs is one of a foot artillery sergeant, a grade that in other branches that wore a Model-1840 sword, pictured as wearing the short sword. The same series show a private and corporal without swords. The situation with officers is also fairly complicated. All field officers of artillery and also those company officers of light artillery units wore the Model-1850 staff and field sword. Previously light artillery officers wore an officer's version of the enlisted light artillery sword similar to the practice in cavalry. Foot artillery company grade officers wore the Model-1850 foot officer's sword.